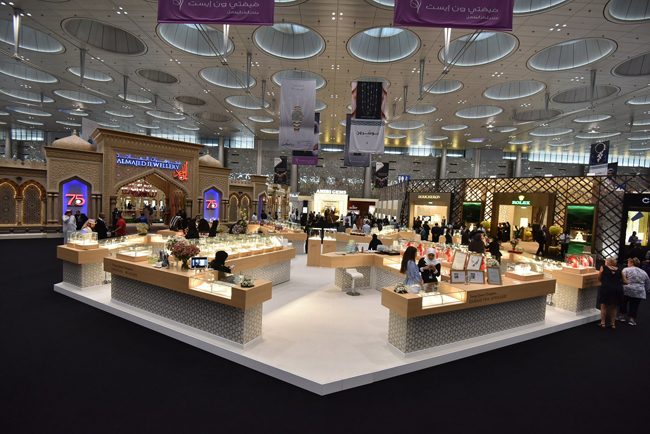 The Young Qatari Designers presented at the heart of the 15th edition of the Doha Jewellery and Watches Exhibition 2018 (DJWE 2018), have witnessed a large number of visitors and industry leaders, flocking to view their exclusive collections, exhibited alongside prestigious international brands at the Doha Exhibition and Convention Center (DECC). Held under the Patronage of the Prime Minister and Minister of Interior, HE Sheikh Abdullah bin Nasser bin Khalifa Al Thani, the Young Qatari Designers (YQDs) initiative is one of the exhibition’s key pillars to support and develop young creative talent by providing a global platform to present their jewellery. The Young Qatari Designers initiative shines a spotlight on three new and three returning talented designers, including Nada Al Sulaiti (Hairaat); Nouf Al Meer (Nouf Jewellery); Ghada Al Buainain; Leila Abu Issa (Leila Issam Fine Jewellery); Shikha Mohamed- Al Ghla Jewellery; and Jawaher & Hissa Mohammed Al Mannai (Ghand Jewellery). The Young Qatari Designers pavilion was honored with the visit of His Highness Sheikh Tamim bin Hamad Al Thani, the Emir of the State of Qatar, who was presented unique collections of jewellery and gems. Over the first days of the exhibition, a large number of visitors and VIPS visiting the pavilion praised the details of the designs, the way they were displayed and the refinement of these luxurious pieces which represent Qatar in this exhibition. The Young Qatari Designers’ selection of fine jewellery attracted a large number visitors and some of the unique pieces were sold immediately. A fresh addition to the 15th edition of DJWE is the ‘Milestones’ charity auction where proceeds will be given to Education Above All (EAA), a global movement that contributes to human, social and economic development through the provision of quality education. The new partnership between DJWE and AlBahie Auction House will promote the Young Qatari Designers by hosting an auction on Sunday (February 25), where buyers can bid on a signature piece designed by this year’s six local designers. The six luxurious lots for the auction include bespoke jewellery pieces that will leave a personalised mark at DJWE. Ghand Jewellery will be presenting “Mihrab”, a pair of diamond and white gold earrings designed as tops of curving archways with suspending lines of baguette and round-cut diamonds set in8.61 grams of white gold with 2.74 carat white diamonds. AlGhla Jewellery will present “Tiara” as their signature piece, set in yellow gold with the outline of the State of Qatar in mother of pearl amongst starbursts of rubies. Leila Issam Fine Jewellery will showcase “Ombres”, a pair of white gold diamond and pink sapphire earrings each designed as tops of round and petal-shaped sapphires with yellow diamonds suspending a line of white diamonds and terminating in round- and petal-shaped pink sapphires. “Qatar” is Nouf Jewellery’s item for the auction, a Qatari flag inspired white gold hinged-bracelet with 2.05 carat round-cut diamonds and 11.80 carat rubies, totaling 684 stones set in36.85 grams of white gold. The auction will also feature Hairaat’s “Sleeping Beauty”, a pair of drop earrings each designed as tops of oval-cut natural turquoise framed by round-cut diamonds suspending a single Tahitian pearl, in addition to Ghada Al Buainain Jewellery’s “Pipe in Gold”, a white gold necklace erupting in a spectacular cluster of pearls and diamonds. The Young Qatari Designers are presented alongside more than 490 acclaimed brands from 10 countries. This year’s 15th edition of DJWE has already witnessed a flurry of luxury reveals including Adler who showcased its newest creations, Tag Heuer presented the connected modular 41, and Louis Moinet unveiled a new Qatar Tourbillon, as well as IWC Schaffhausen exclusively targeting females with the new Da Vinci Automatic 36. Returning to exhibit this year are Qatar’s premier jewellery patrons, who continue to support and present their unique world-class collections; Al Fardan Jewellery Company, Ali Bin Ali Group, Al Majed Jewellery, Amiri Gems WLL, Fifty One East, and Almuftah Jewellery. Doha Jewellery and Watches Exhibition 2018 is presented by Qatar Tourism Authority (QTA) and delivered by Auditoire.